Windows Vista Ultimate edition is the top end, full featured and most expensive version of Windows Vista editions available on the market which include Windows Vista Enterprise edition, Windows Vista Business edition, Windows Vista Home Premium edition, Windows Vista Home Basic edition and Windows Vista Starter edition. And Microsoft is pushing and promoting Vista Ultimate as the ultimate and best choice with all types of enticing, freebies, promotion and extras. The latest been downloadable “Ultimate Extras” add-on bundle package, unveiled by Bill Gates during his keynote in 2007 CES to attract and tempt potential buyers to spend more money to buy Windows Vista Ultimate, instead of less-featured but cheaper edition. A Vista-customized version of the Texas Hold ‘Em poker game designed for smooth animated play and rich graphics. 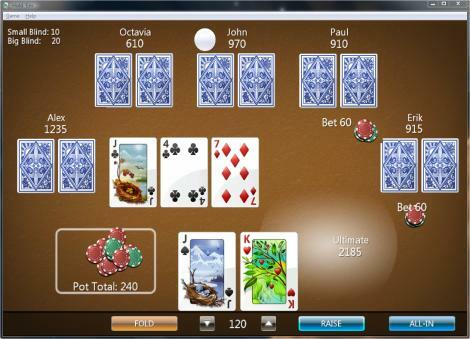 Users can change options to play against up to five computer players, set the opponents’ skill level, and customize the look of the card deck and playing table. After you install this Windows Ultimate Extra, Hold ‘Em will appear in the Windows Vista Games Explorer. BitLocker Online Secure Key Storage and EFS Enhancement, where Ultimate customers will be offered a secure place to store and backup their BitLocker encryption keys, recovery password and Encrypting File System (EFS) recovery certificates in the digital locker in the online secure Windows Vista Marketplace, so that the keys can be retrieved over the web when lost. Windows BitLocker Drive Encryption provides increased security by encrypting everything on your hard drive including data, programs, and even Windows itself, and perform system integrity check when equipped with Trusted Platform Module (TPM) 1.2 chip. BitLocker encryption is a feature of the Ultimate and Vista Enterprise SKUs only. Also available in the Extras is Windows BitLocker Drive Preparation Tool that configures your hard drive so that you can use the BitLocker Drive Encryption feature of Windows Vista. Windows DreamScene, or Motion Desktop is animated wallpaper technology that allows and enables you to use and set video as your desktop wallpaper. Windows Vista digital publications which consists of tips and tricks, hacks, blog links and other resources for getting the most out of Ultimate. Upcoming component in the Ultimate Extras is Group Shot (not in the initial first wave or Extras release), a photo-imaging tool what allows you to combine, build and create a composite group photo or image out of a series or group photos or just part of the images. Microsoft promises to release for public free download more Ultimate Extras programs, downloadables, add-ons and enhancements. Ultimate Extras will available on the same day as the general availability of Windows Vista in public retail channel, i.e. 30th January 2007. If you’re using Windows Vista Ultimate, the Ultimate Extras downloads will automatically appear in Windows Update, where you can select to download the Extras from Windows Update website. More information about Ultimate Extras can be found at Windows Vista Ultimate website.